What you choose to race in is important because it’s what you’re going to wear for the entire race; whether you’re dirty, muddy, sandy hot, cold, climbing walls, climbing ropes or running at a full out sprint. This is the time to leave your baggy cotton sweatpants at home and choose something more appropriate for game day. And what might that be you ask? Below are some recommendations on what to wear – specifically for a Stadium Sprint. Clothing: Your clothing should be form-fitting, nothing loose or flapping around ready to get caught on barbed wire, walls or ropes – thus the popularity of compression gear. Under Armor and Nike Pro both make compression gear for men and women that can be found on the bodies of the elite racers at Spartan races. Taking a note from their choices, men often wear compression shorts and compression tanks or t-shirts, where women typically wear compression shorts or capris and sports bras or shirts. If your event will have water and/or mud, your cloths should be water wicking and fast drying. If the environment you are racing in is hot, wearing fewer closes will keep you cooler. If it’s bitter cold you need to decide if longer clothing will keep you warmer. Remember, when wet, shorter sleeves and legs keep cold fabric off of your skin – skin dries faster than fabric. Compression Sleeves: Compression sleeves were originally advertised to promote recovery after a race, however, you will see many racers wearing them during a race to promote on course stability and strength, reduced cramping and protection. Choosing the right arm or calf compression sleeves is important. Choosing the wrong sleeve can cause a loss of blood flow, bloating of the limbs and even muscle fatigue. So while sleeves may be considered advantageous, be sure you have tested your sleeves on a run of similar length before the event. Also, before you follow the masses, be sure you determine if sleeves will make you perform better before you race in them. Shoes: Your shoes should be appropriate for the train you’re racing on. If you’re doing a stadium sprint any street type running shoes will work well. Shoes with large tread or lugs will slow you down and will not grip the slick concrete floors and steps of the stadium. This could produce a nasty spill while rounding a corner. Your shoes should fit well but not be over tightened. 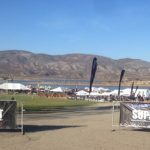 As with the other gear mentioned in this blog, be sure you have tested your gear before your event. It is also important to combine good socks with your shoes. Socks: As important as your shoes are your socks – they make a great pair. For a sprint, you do not need the extra padding that a thick sock provides a long distance runner. Therefore, choose a good lightweight running sock that rises above the brim of your shoe. There are many providers of quality running socks these days, two favorites are the SmartWool PhD Running sock and the Thorlo Experia sock. Both of these socks provide padding at the impact area and thin, breathable support else ware. They also come in wool versions for those cold weather runs. Choose a shoe and sock combination that you have tested before the event so that you do not find yourself getting blisters at mile one. Backpacks and Hydration Packs: You will see many racers caring backpacks or hydration packs (water sources) during the event. You may be tempted to follow suit and carry one yourself as you want to stay well hydrated. The reality is, your hydration begins before the race even starts and you should be properly hydrated before the gun goes off. All races have water stations were you can re-hydrate along the way without the need to carry a big water bladder along with you. In addition, if the Sprint has water, swimming with a large water bladder in a mud pit that has been stormed by 25,000 other people should raise some health issues. As far as backpacks, especially true at a Sprint, there is little to nothing that you need in a backpack for the short distance of a Sprint. Gloves: If you’re running a Spartan Stadium Sprint gloves are completely fine. This is the only time gloves will get an endorsement. 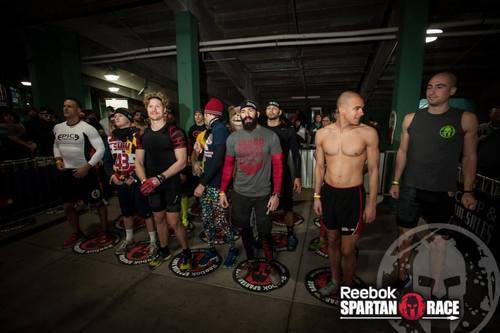 The Stadium Sprint has lots of grip based obstacles such as the cargo net, rope pulls and climbs and heavy carries. And with the elimination (or reduced amount) of water, gloves may actually server you well. Be sure the gloves are broken in and that they fit well. Remove the fingers of the glove at the middle knuckle so that you have increased sensitivity in your fingers. If you were running any other Spartan distance such a Spartan Sprint, Super, Beast, etc., gloves get wet and slip as easy if not easier than you’re bare hands. Remember you’re going to get some bumps, bruises, and cuts during this event, so a sore spot on your hands is to be expected. Hats and sunglasses: You will not be on the field, hopefully, long enough to appreciate the benefits of a hat or sunglasses. These items will only slow you down as you will have to take them off for fear of losing them during most all of the obstacles. Leave them at home. Fuel: Be sure that you start this event with some fuel in you. Test some meals out to be sure that they do not cause gas, fatigue, cramps or digestive issues before the event. If you have an early start, get up early, eat and return to bed. If you have a late start, have a good breakfast and a healthy snack at noon. An hour before the event be sure to eat a small snack such as a Cliff Shot, some Shot Blocks, or a raw meal bar. Protein shakes, Chia seeds, etc. are good choices at this point as they are easy to digest and add another source of hydration. Avoid bars that take a long time to digest; you won’t have time to utilize their benefits during a Sprint. Hydrate: When you wake up in the morning, you should be peeing clear. To maintain that be sure you continue to hydrate up to your start time. To be sure you are not sorry during the race, as we often tell our children, try to go to the rest room before you enter the starting gate, even if you don’t think you have to – you may be surprised.